Sànchez, D.; Belanche, Ll. ; Blanch, A. The aim of this paper is to report the achievement of Ichnaea, a fully computer-based prediction system that is able to make fairly accurate predictions for Microbial Source Tracking studies. The system accepts examples showing diff erent concentration levels, uses indicators (variables) with diff erent environmental persistence, and can be applied at diff erent geographical or climatic areas. We describe the inner workings of the system and report on the specifi c problems and challenges arisen from the machine learning point of view and how they have been addressed. Sànchez, D.; Belanche, Ll. ; Blanch, A. 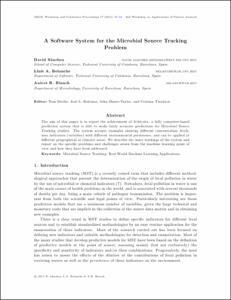 A software system for the microbial source tracking problem. A: Workshop on Applications of Pattern Analysis. "Proceedings of the Second workshop on applications of pattern analysis: 19-21 October, 2011, CIEM, Castro Urdiales, Spain". Castro Urdiales: 2011, p. 56-62.